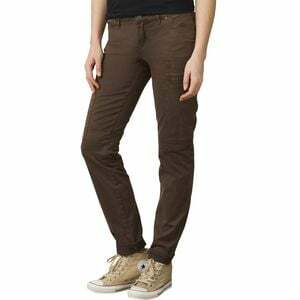 Product Condition: The Louisa Skinny Leg Pant - Women's is in Excellent condition. These pants were previously owned for three weeks. The following observations were made regarding these item. *They were tried on in indoors for an occasion. *There aren't any defects in them at all. *They got minor pet hair(inside), cleanable. *All items sold as is, all warranties void. From clogs and a sweater at the office to your regular after-work gym date with your honey, the Prana Louisa Skinny Leg Pant will see you through a busy workweek with laid-back comfort and class. Prana's pants are built to be moved in, so you can trust the Louisa's organic cotton blend not to give way when you're readying for a big move on the wall. After you hop off, the fabric stretches right back into place, so head out to dinner with friends to refuel without having to change into something else. Copyright © 2000-2019 GearTrade, Inc. All Rights Reserved.